A few years ago, I went to Venice during its acqua alta season. Some tourists travel to Venice specifically for the acqua alta. Others avoid Venice at this time. 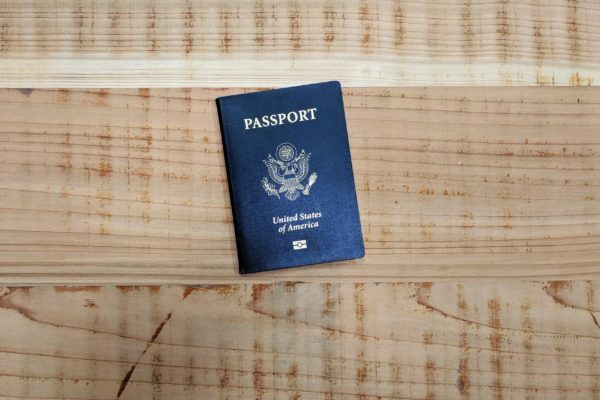 I did not know about it until my travel companion and I arrived during our European vacation. It was quite a unique experience, and one that I am glad I had the chance to see firsthand! 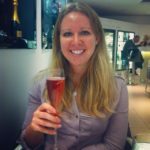 Looking for more crazy travel stories? 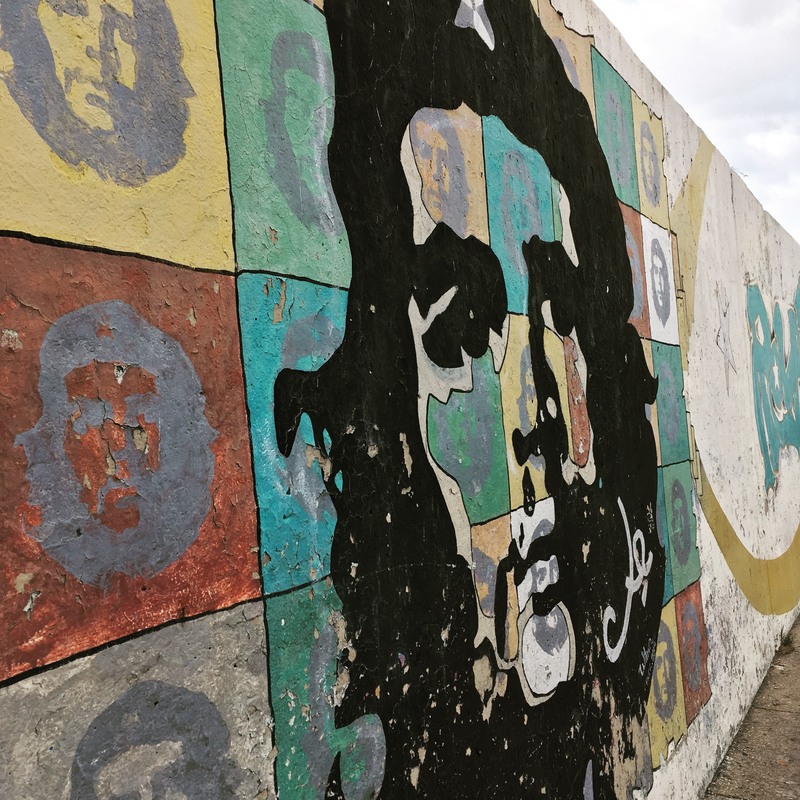 Check out this one about The Time I Tried to Go to Nicaragua! What is the Acqua Alta? The official Venice CityPass website describes the acqua alta as “nothing more than a spike in the high tide affecting the city in the Fall and Winter”. The Adriatic Sea, to which the Venice Lagoon is connected, experiences daily tidal waters caused by the moon. These tides occur year-round. When they are accompanied by scirocco, strong winds crossing the Mediterranean that push water into the Lagoon where the city of Venice sits, the acqua alta occurs. An odd experience for visitors, the acqua alta has occurred in Venice every year for hundreds of years, so it is part of daily life for inhabitants. When I lived in London, I had a week break “for studying” in early November. Seeing as final exams were not until mid-December, I instead decided to use this week for traveling. A friend from Boston came across the pond to travel with me for the week. We agreed to spend the first half of the week in Barcelona and the second half in Venice. Our timing was purely based on my schedule. 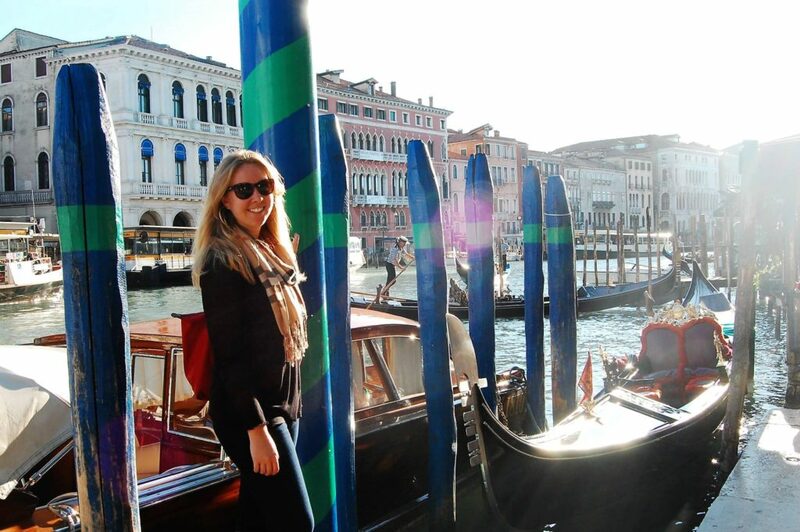 How we expected to find Venice: Gondola rides in the canals! 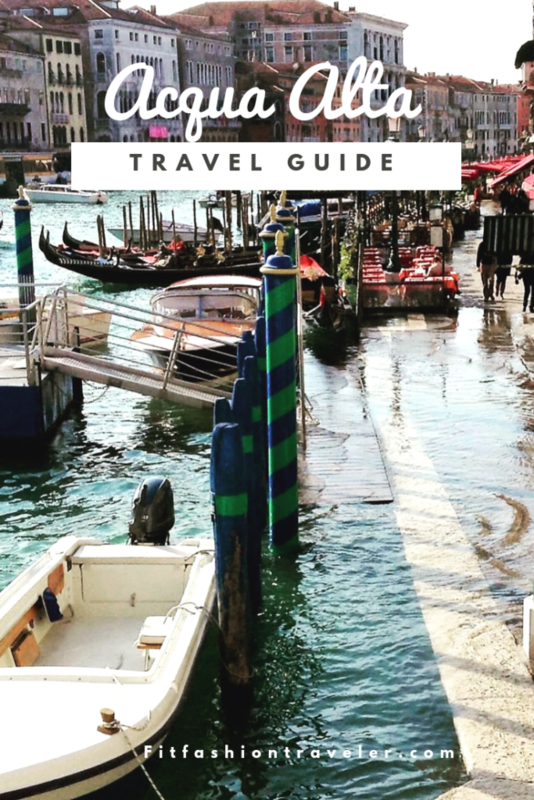 During our pre-vacation research we read about gondola rides, Aperol spritzes, the Piazza San Marco, Dodge’s Palace, and this phenomenon called acqua alta. 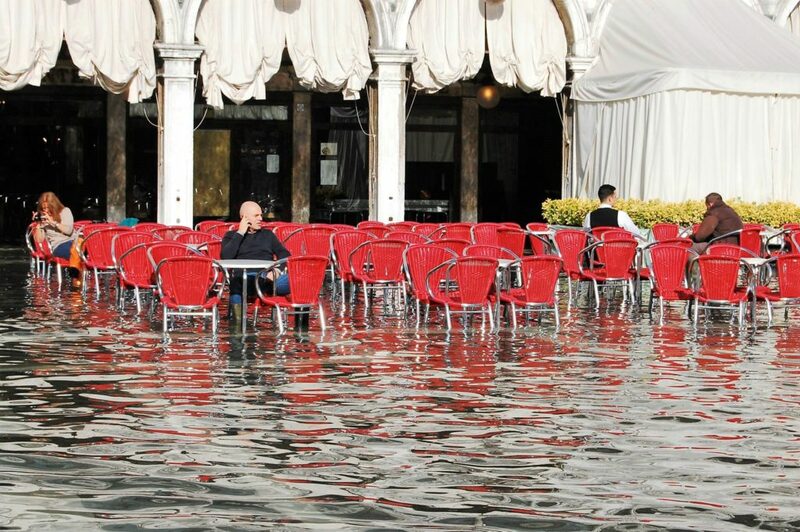 I had heard rumors about Venice “sinking”, but thought it was sinking in the same way the Maldives are sinking: because ocean levels are rising very slowly, one day low-lying lands will be fully covered with water. However, the Maldives aren’t facing this fate until at least 2030. 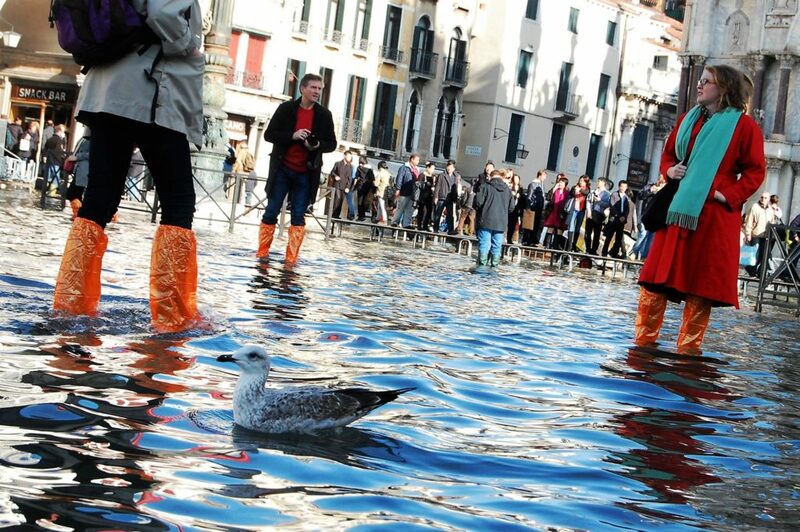 It is not an annual occurrence like the acqua alta. I was hopeful my friend and I would experience the acqua alta during our trip after reading about it. To my disappointment, the sidewalks and piazzas were bone dry when we arrived on a Thursday afternoon. This did give us time to spend the afternoon and evening wandering around Venice’s streets, exploring the city and trying to get lost among its many twists and turns. 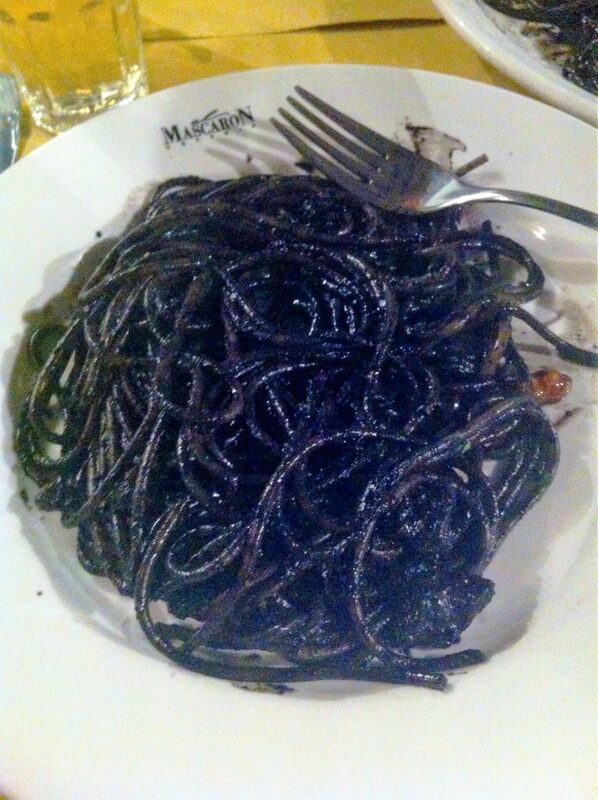 We headed for the Ponte Rialto, crossed the Grand Canal, enjoyed a glass of Italian wine at an outdoor cafe, stopped in a few shops selling murano glass souvenirs, and ended the night eating squid-ink pasta and drinking our first Aperol Spritzes. 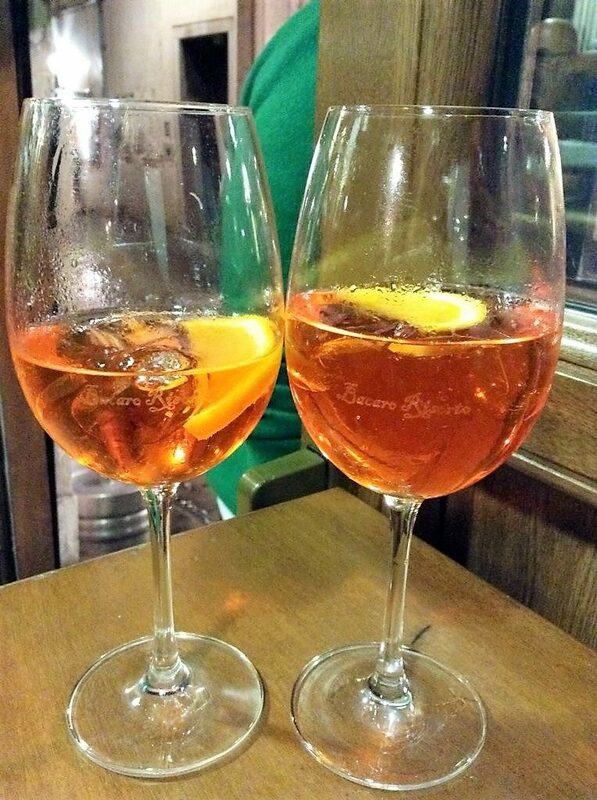 Note: if you dislike Aperol, drinking it as a spritz does not make it better. My travel companion and I had met only a few months prior and were still trying to impress each other, so we spent all weekend drinking this “signature” Venetian drink that we both disliked. We only admitted this to each other months later! The Albergo Cavalletto & Doge Orseolo hotel in which my friend and I stayed was just outside of the Piazza San Marco. You can book this perfectly-located boutique hotel here*. Our first morning in Venice, I woke up and opened our window shades to look out at the square. I couldn’t believe what I was seeing. “Alex, you have to come look at this,” I said. There were fish swimming down the sidewalks on which we had walked just a few hours before! The acqua alta was upon us. This was not a slowly-occurring phenomenon, but one that appeared suddenly for a few hours almost every morning in the Fall and Winter! The first issue we dealt with was that our hotel was now surrounded by water a few inches deep. We needed to figure out how to still go out and enjoy the flooded city. Our shoes were not going to last for hours of wading. 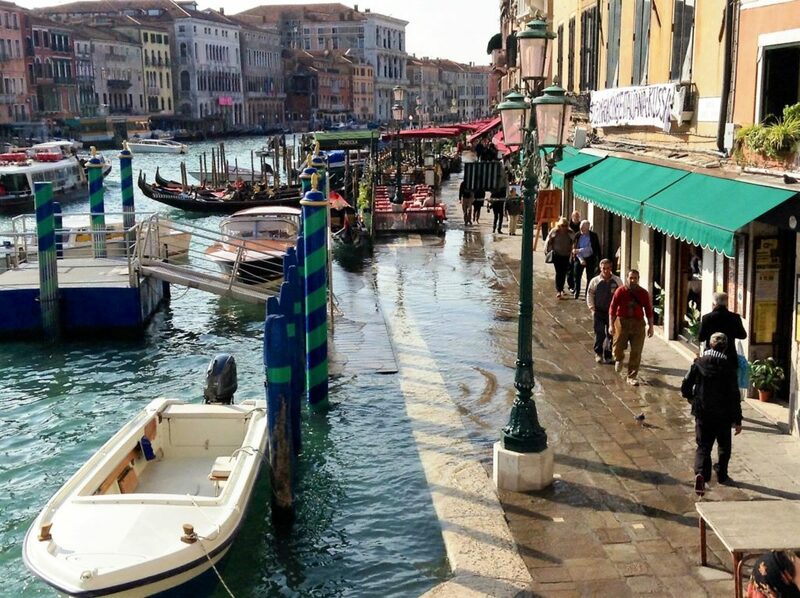 Luckily for us – and most tourists – the Venetians had found a solution to this. Every souvenir shop, including the one across the street from our hotel, sold “acqua alta boots,” or thin plastic knee-high covers that go over your shoes and pants and are secured by elastic bands. They are available for about 10 euro when you are in Venice, but you can also get yours ahead of time on Amazon here*. The Venetians were clearly used to the acqua alta. They all had their acqua alta boots ready to slip over their very nice Italian shoes. They were content to go about their days as though there was not water all around them. The outdoor cafes were still open, and people were sitting around enjoying their morning coffees as birds and fish swam by their ankles. 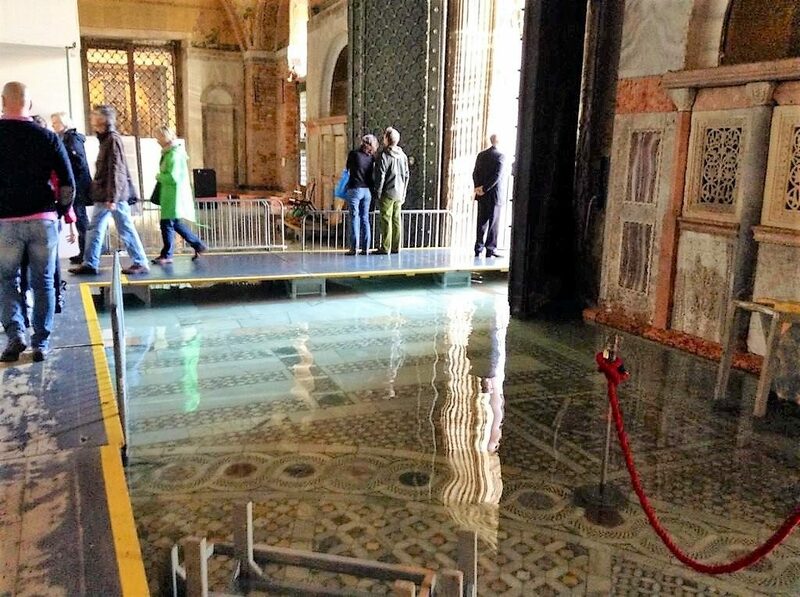 Those in charge of the San Marco Basilica had set up temporary platforms for tourists to wait on above the water outside the cathedral and in the foyer. And of course, the gondola rides continued as usual. The same spot I had taken a picture by gondola boats the day before! By the time we ate lunch, the water had receded. 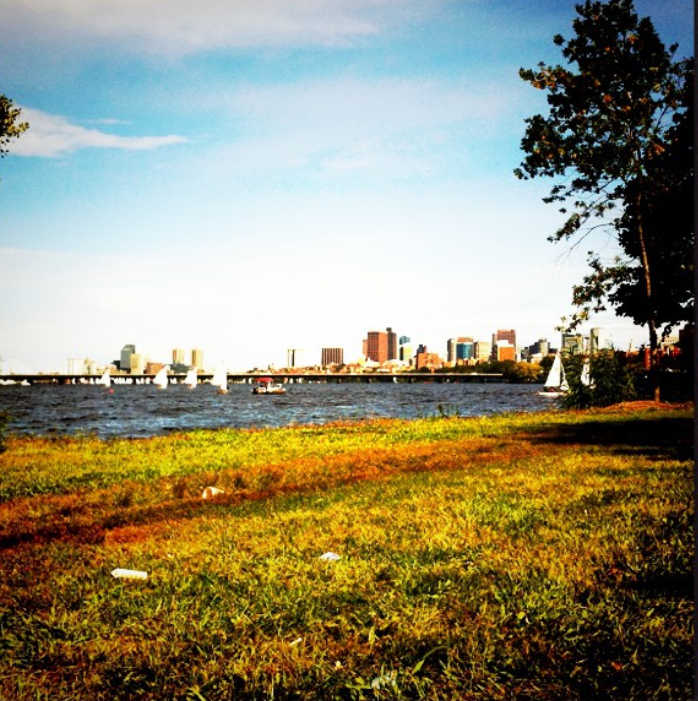 My friend and I shed our boots and continued our exploration of the city. We were far more prepared the next morning when the sidewalks were flooded again! Most sources say yes, the city is slowly sinking. However, this is unrelated to its acqua alta floods. The land on which Venice is built is boggy, not solid, and therefore it is sinking under the weight of the buildings. On the other hand, acqua alta flooding was first noted in 589 A.D. It has occurred every year since. If the flooding was evidence of sinking, surely the city would have sunk by now. Instead, the tidal floods are seasonal and cyclical, similar to those in the Bay of Fundy in Canada. 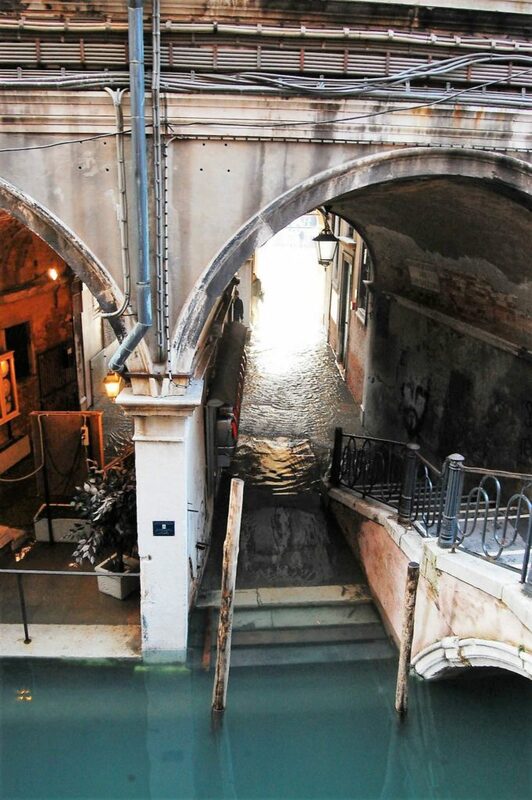 An inconvenience to some, a unique experience to those with open minds looking for some fun, the acqua alta is not evidence of the sinking of Venice. 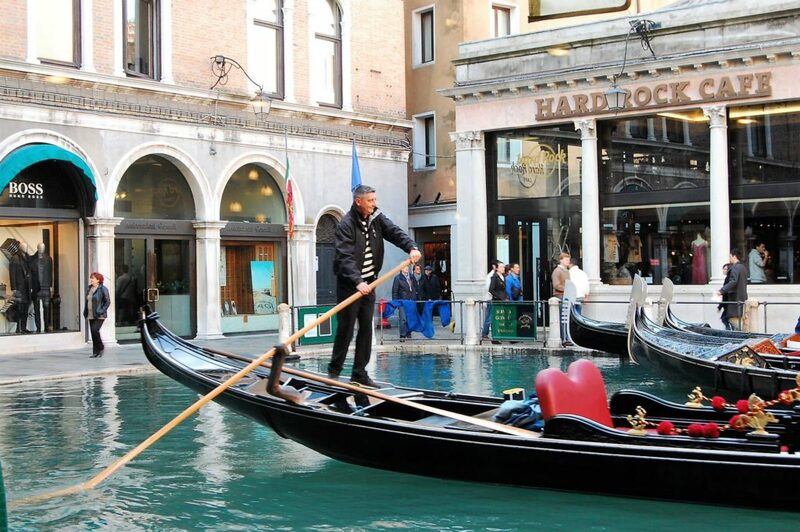 Next time you are planning a trip to Venice, go in November or December to experience the acqua alta phenomenon! *Note, this page contains affiliate links. This means if you make a purchase after clicking on one of the links, I may receive commission at no extra cost to you. Thank you for contributing to the operating costs of this website! I have seen this before on travel shows. The alarm sounds and everyone prepares for the rising water. We had a similar phenomenon in San Diego with the tide pools. Not only does the water rise higher on those days but it falls further as well. Some spots were exposed that were usually under a foot or two of sea water. I haven’t heard about it in San Diego before, so interesting! That is highly interesting. I had not heard of the acqua alta before your post. I have only been to Rome though. I think I would prefer to not visit during this time but I do find it quite fascinating. Especially the “boots” they sell! Definitely a very useful heads-up post! Thank you! I heard it was extremely bad this year with much more water than pictured here, so perhaps visiting Venice in a different season is prudent after all! What a fun experience. I live the stylish acqua Alta boots. I cannot imagine what it would be like to go to bed with dry streets and wake up to see fish swimming on those same streets. 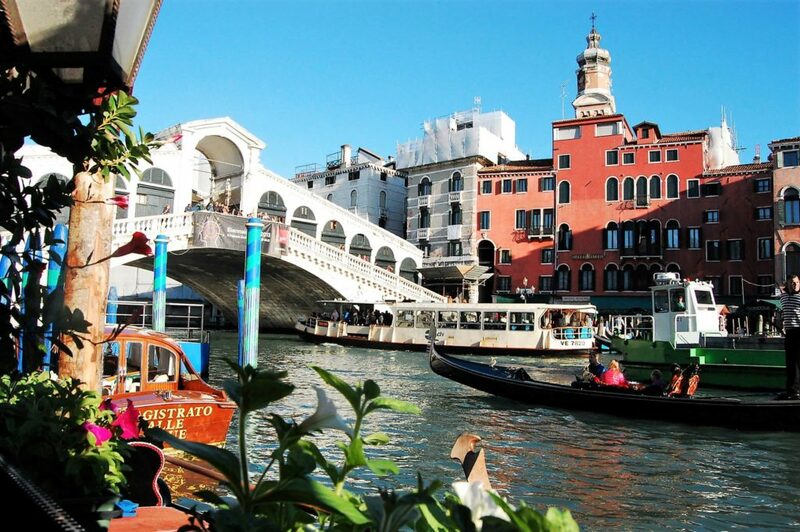 Now, I want to visit Venice during this season. Thank you! It was the weirdest experience, especially not knowing it was going to happen, but I’m glad I was there for it! My grandparents visited Venice during the acqua alta and like you didn’t know it was going to happen. I love those orange rain boot covers! It must make Venice feel even more surrounded by water! Hopefully, I get to experience this for myself one day! It’s so strange to suddenly wake up with all the sidewalks covered in water; I’m sure your grandparents were as astounded as I was! 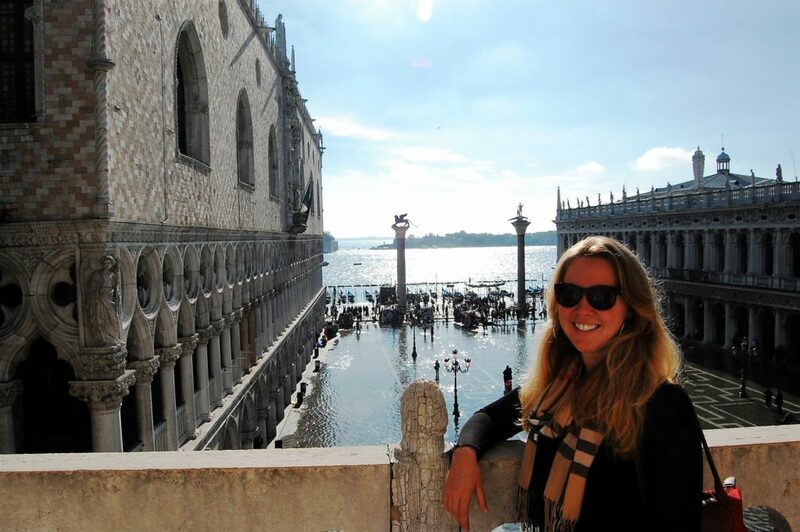 It so great that you were able to experience Venice with and without the acqua alta! To have both experiences is truly a stroke of good luck. I saw a television show a few months ago about Venice sinking. I’m so glad you explained the difference because I initially definitely confused the two! I was very lucky, it was a great trip! I’ve never seen anything like this! On the one hand, it seems like it would be so inconvenient but obviously, the city is prepared for it and everyone just seems to work around it. There’s a lot to be learned from that attitude, especially as travelers! And, I’m slightly tempted to buy the acqua alta boots just to have in my suitcase for unexpected rainstorms on my travels! 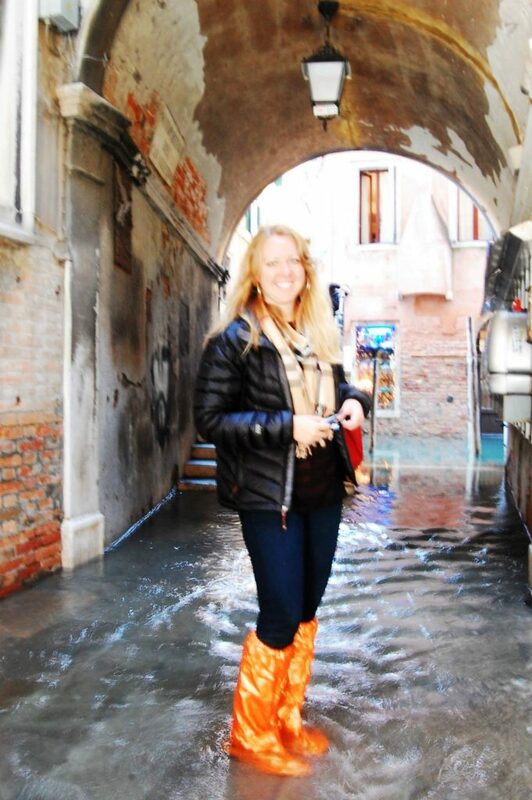 I still have my acqua alta boots and pull them out for bad rain storms or even snow sometimes! WAY too much fun! And of course, enterprising businesses have created a special orange plastic cover they will sell tourists so you can all go splashing about with glee. 😉 Been to Venice several times, but never during acqua alta — must make a note to plan that in the future. Definitely, it’s quite the experience! I highly recommend it! It may even be more fun if you are aware it is going to happen while you are there! The rising water would really freak me out! lol Venice looks gorgeous but I haven’t been yet. Looks lovely from the pictures and your trip sounds very fun. Thank you! The acqua alta only occurs at specific times of the year, so you could also plan your trip at a time when it definitely would not happen, and just enjoy the city’s (dry) beauty! I just saw how bad it got this year from the water tiles. People were walking around and dining in restaurants with water up to their knees. It must of been an incredible site to see. I wrote this article right before the reports came out for this year: the one-to-two feet of water was fascinating, but I can’t imagine being there in waters higher than that!